You’ve probably come across Foxin Wins in one of his other incredible slots, but now he has ventured into the world of sport. 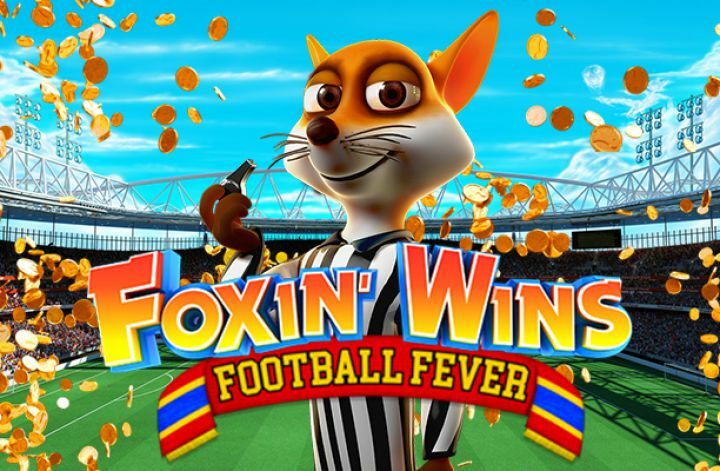 NextGen Gaming has given Foxin Wins the full football makeover for this latest edition in the series, which is aptly named Foxin Wins Football Fever. But will it create a fever pitch or is it more of a foul? 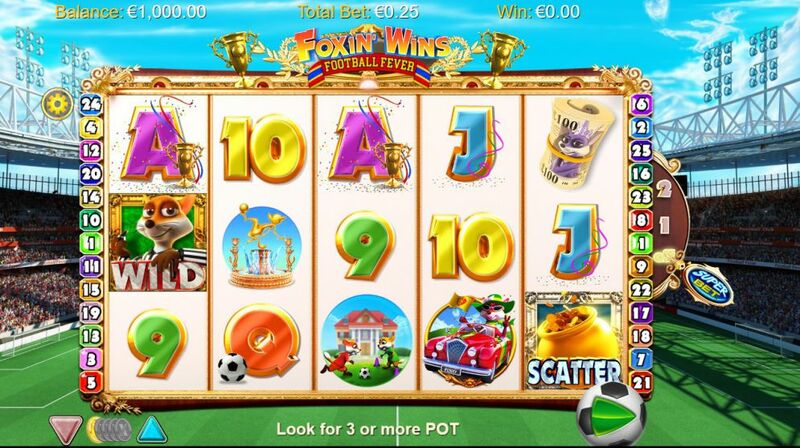 Foxin Wins Football Fever is a 5-reel, 25 pay line slot, offering an RTP of 95.61%. As we know with other Foxin Wins games this lower RTP doesn’t necessarily mean bad things, as we have had great wins with these games in the past. As ever NextGen Gaming have filled Foxin Wins Football Fever with plenty of extra’s to keep you busy. The game is set against a football stadium with lots of interesting sounds playing in the background, which you can turn off if you wish. When it comes to symbols you have the usual playing cards which include A, K, Q, J, 10 and 9. There is also Mr Fox playing football, driving a convertible car, a grand water fountain and a wad of cash. Wild Symbol – Mr Fox is the wild symbol and he is dressed as the referee, so keep an eye out for him landing on the reels. He will substitute for all other symbols except the scatter and is the highest paying in the game. Land 5 of these on a winning line to bag the jackpot of £2,000. Scatter Symbol – A pot of gold is your scatter symbol and landing three or more of these anywhere on the reels will trigger the bonus spins feature. Superbet Feature – Superbet is a brilliant addition to Foxin Wins Football Fever and its something NextGen Gaming have on all Foxin Wins games. You will see to the right-hand side of the reels a switch that can be moved from off, to 1 and then to 2. Superbet places fox pups behind the reels and then can randomly trigger extra wilds on the reels. At the off setting you have a fox pup added to reel 3 at no extra cost. Level 1 adds fox pups to reels 2 and 4 and increases your bet by 10 coins, making it 35p minimum bet and £35 maximum bet. But, level 3 is where it gets exciting as fox pups are added to all reels, meaning at any time between 1 to 5 extra wilds could be added to the reels, helping to complete even more winning combinations. It does increase your bet again to 50p minimum and £50 maximum, so be 100% sure you want to play superbet at levels 1 or 2 before doing so. Bonus Spins Feature – Upon landing three scatter symbols you will be instantly awarded 10 bonus spins and all wins are doubled. Retriggering the feature is a possibility as well, so hope for more scatters landing to help you win more. Those pesky fox pups are back for more fun here too. Making their presence known by throwing in a few wilds more frequently in the bonus spins feature. Additional Bonus Features – Foxin Wins Football Fever also plays host to two additional bonus features. They are the Leprechaun Shakedown and the Fox Funds, and both trigger randomly after any paid spin is made. Fox Funds – nothing beats instant gratification and whilst playing Foxin Wins Football Fever there is such a thing. Fox Funds when triggered will award an instant prize straight to your balance, talk about scoring! No overtime needed here in Foxin Wins Football Fever, the wins line up nicely and often. The random bonuses don’t land as often as you would think, but that’s forgivable as the bonus spins and the wins in the main game more than make up for it. There could have been a bit more tweaking done with the features to tie them in with the theme. Especially as it is aimed towards football fans, but it didn’t have too much of a negative impact. Overall the game was fun to play, it was animated well in most places and well timed, meaning it should prove popular with everyone.